A building-integrated photovoltaic (BIPV) system is an integral component of the building skin that converts solar energy into electricity and, simultaneously, provides protection from climatic conditions as well as noise to the building structure. BIPV is currently one of the rapidly expanding segments of the global solar PV industry. In order to address challenges associated with climate change, major regions across the world are developing policies to move toward ultra-low-energy buildings. The European Union (EU) Energy Performance of Buildings Directive (EPBD) requires all new buildings to be nearly-zero-energy buildings (nZEB) in all EU member countries by the end of 2020. Outside of Europe, the U.S., Japan, and South Korea have also formulated ZEB policies and set goals. Certain leading subnational governments, most notably the U.S. States of California and Massachusetts in the U.S., have set ambitious ZEB targets. For example, the State of California has set the ambitious goal that “all new residential buildings in the state would be zero net energy (ZNE) by 2020 and all new commercial buildings would be ZNE by 2030.” Japan has established targets for ZNE in new public buildings by 2020 and all newly constructed buildings by 2030. In 2014, South Korea formulated the “Activation Plan of Zero Energy Buildings” and set a roadmap to achieve targets along with a financing strategy and subsidies for pilot projects. Such supportive policies are driving the global building-integrated photovoltaics market. Use of the BIPV (building-integrated photovoltaic) technology converts buildings from energy consumers into energy producers. In order to achieve this, the construction technology is required to be merged with the BIPV technology. The photovoltaic (PV) technology is new and expensive for curtain walls and other aspects of buildings. 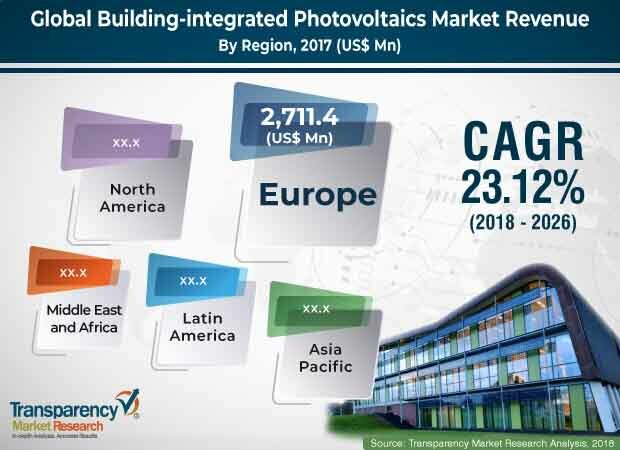 Moreover, lack of awareness about and inadequate marketing of BIPV products in Vietnam, the Philippines, and certain countries in Africa are likely to hamper the building-integrated photovoltaics market in these countries during the forecast period. Surge in population across the globe, growth of the industrial sector, and rise in infrastructure development activities are boosting the demand for electricity. Electricity has enabled functions such as transportation, industrial activities, and services. Demand for energy is increasing, due to economic growth of countries and rise in the standards of living. Countries across the world are increasing their electricity generation capacity by establishing new plants or by increasing the capacity of the existing plants to cater to the rising demand for electricity. Due to stringent government regulations regarding greenhouse gas (GHG) emissions, companies are focusing on developing low-cost sources for generation of renewable energy. Rapid growth of the construction sector is projected to create opportunities for companies to invest in the global BIPV market in the near future. According to the International Energy Outlook–2017, total energy consumption in the world is expected to increase from 575 quadrillion British thermal units (BTUs) in 2015 to 736 quadrillion BTUs by 2040, which is an increase of 28%. In September 2017 itself, Onyx Solar Group LLC installed transparent photovoltaic glass at Brunel University in Uxbridge, West London (the U.K.). The glass was installed in the curtain wall of the university’s Wilfred Brown Building. The building features 42 units of PV glass of different sizes, some of which are 2.6 meters in width. This project is a part of remodeling of the 4,710-square-meter building. In June 2017, Hermans Techniglaz BV was commissioned to supply tailor-made PowerGlaz BIPV solar panels to the town hall of Albrandswaard, Poortugaal (the Netherlands). The town hall was being renovated and sustainably improved. In June 2017, Hermans Techniglaz BV commissioned to supply PowerGlaz BIPV solar panels for the construction of Vakcollege Tilburg, a school in the Netherlands. These semi-transparent solar panels were installed in skylights of this school. In May 2016, ViaSolis won a contract for supply of PV modules to cover a roof in California (the U.S.) for one of the world's largest corporations. In January 2015, ViaSolis glass or glass PV modules received the first certification from Electrosuisse, Switzerland’s main certification body, for their design and safety. It was the first certification granted to any PV module by Switzerland’s quality trademark. Qualification tests were conducted by SUPSI, the Swiss PV Module Test Center. In November 2014, ViaSolis started production of framed glass/glass modules. Compared to frameless modules, framed modules are easier to carry and they do not require any exceptional care during handling. Europe dominated the global building-integrated photovoltaics market in 2017. Increasing government incentives, renewable energy targets, and rising investments in the solar technology in the region are expected to drive the building-integrated photovoltaics market in Europe during the forecast period. Moreover, the market in Asia Pacific is expected to expand at a rapid pace during the forecast period. Rapid growth of residential and commercial construction sectors in Asia Pacific is boosting the market in the region. BIPVs can add unique visual elegance and architectural beauty to a building in addition to saving electricity costs and increasing the overall efficiency. Thus, the demand for BIPV products is anticipated to increase in the near future. The report comprises profiles of major companies operating in the global building-integrated photovoltaics market. Key players operating in the global market are ISSOL SA, Onyx Solar Group LLC, BIPVco Ltd, ViaSolis, ertex solartechnik GmbH, Sphelar Power Corporation, NanoPV Technologies Inc., B Navitas Green Solutions Pvt. Ltd, Ankara Solar AS, Hermans Techniglaz BV, Jiaxing Feiya New Energy Co., Ltd, and Polysolar Ltd. The world is currently facing challenges arising out of shortage of conventional fossil fuels and degradation of the environment. In order to overcome these issues, renewable energy resources are being tapped increasingly. The need to produce energy from renewable resources has risen. BIPV is a type of renewable energy resource. Building-integrated photovoltaics (BIPVs) is the integration of photovoltaics (PV) into the building envelope. It is gaining more attention, as it can substitute traditional construction materials. Currently, in the European Union (EU), buildings are responsible for 36% of CO2 emissions, but buildings can fulfill 32% of the EU’s energy demand if they use building integrated photovoltaics (BIPVs). The U.S., Japan, and Germany are major countries in terms of BIPV installations. BIPVs are receiving high attention in the U.S. State of California, as the installation of solar panels on new buildings is mandatory in California. According to the California Energy Commission (CEC), nearly 75,000 new homes are expected to be built statewide by 2020. This is expected to drive the BIPV market in the U.S. during the forecast period. This report analyzes and forecasts the building-integrated photovoltaics market at the global and regional levels. The market has been forecast based on value (US$ Mn) and volume (kW) for the period from 2018 to 2026, considering 2017 as the base year. The study includes drivers and restraints of the global building-integrated photovoltaics market. It also covers the expected impact of these drivers and restraints on the demand for BIPVs during the forecast period. The report also highlights opportunities for the building-integrated photovoltaics market at the global and regional levels. The report includes detailed value chain analysis, which provides a comprehensive view of the global building-integrated photovoltaics market. Porter’s Five Forces model for the market has also been included to help understand the competition landscape of the market. The study encompasses market attractiveness analysis, wherein technology, application, and end-user segments have been benchmarked based on their market size, growth rate, and general attractiveness. The study provides a decisive view of the global building-integrated photovoltaics market by segmenting it in terms of technology, application, end-user, and region. In terms of technology, the market has been classified into crystalline silicon, thin film, and others. Based on application, the building-integrated photovoltaics market has been divided into roofs, facades, windows, and others. In terms of end-user, the market has been segregated into residential, commercial, and industrial. These segments have been analyzed based on the present and future trends. Regional segmentation covers the current and forecast demand for BIPVs in North America, Europe, Asia Pacific, Latin America, and Middle East & Africa. The report provides size (in terms of volume and value) of the building-integrated photovoltaics market for the base year 2017 and the forecast between 2018 and 2026. Market numbers have been estimated based on technology, application, and end-user segments of the global building-integrated photovoltaics market. Market value and volume have been provided for the global, regional, and country-level markets. The report comprises profiles of major companies operating in the global building-integrated photovoltaics market. Key players operating in the global market are ISSOL SA, Onyx Solar Group LLC, BIPVco Ltd, ViaSolis, ertex solartechnik GmbH, Sphelar Power Corporation, NanoPV technologies Inc., B Navitas Green Solutions Pvt. Ltd, Ankara Solar AS, Hermans Techniglaz BV, Jiaxing Feiya New Energy Co., Ltd, and Polysolar Ltd. Market players have been profiled in terms of attributes such as company overview, financial overview, and recent developments. Europe is a leading region of the global building-integrated photovoltaics market. The region constitutes more than 45% share of the global market. The market in Asia Pacific is expected to expand at the maximum pace during the forecast period. Recently, concerns related to fossil fuels have increased. This presents opportunities for service providers operating in the global building-integrated photovoltaics market. The U.S. BIPV market is mostly concentrated in California, followed by New Jersey. In Canada, the market for BIPV in Ontario is expected to expand at a significant pace in the near future. California was among the first states in the U.S. to develop a Green Building Standards code known as ‘CALGreen.’ The code is expected to mandate that the new buildings in the state be more efficient in terms of energy and environment. This is projected to help the International Code Council develop a new International Green Construction Code (IGCC) for commercial buildings.